I'm sure you notices the jars of sweets alongside the candyabra from the Rock Candyabra post the other day. 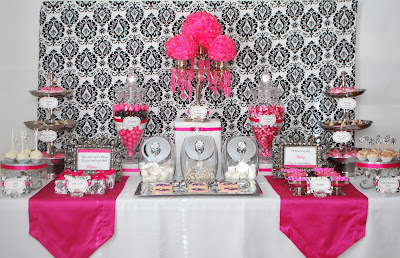 I used it as the centerpiece of a candy display I created for a The Wedding Party bridal showcase earlier this year. 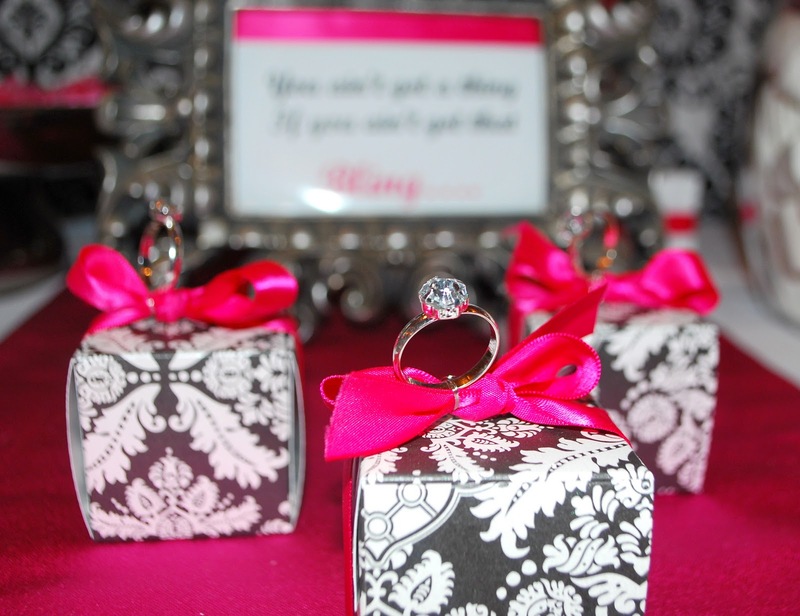 So what will capture the attention of newly engaged brides. Bling of course! "A thing from Bling" was designed to interpret the glitz of the rock on an engagement ring, and the sweet love it represents. I chose a color palette of hot pink, black & white damask, and sparking accents. 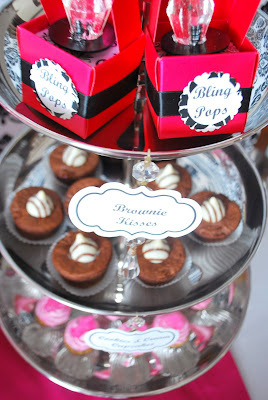 Sweets were embellished with a touch of bling to reflect the theme. "Bling" Pops, Mini Cinnamon buns set atop a cake stand dripping with jewels, bite size Cupcakes topped with "rock" candy, Cake Pops tied with a sparkly set of wedding bands, Bride & Groom custom cookies by Batches, and the piece de resistance, a Rock Candyabra set the stage for a Glitzy sweets display perfectly fit for a Bride to be! More Bling hanging from the cookie jars! Bride & Groom cookies by Batches displayed on a shiny silver platter... Love glitzy details! More bling & glitzy details.. Here's how I used the crystals from the candelabra.. The Rock Candyabra took center stage on the table and was certainly the most talked about piece of the night. The Bling pops came in a close second, which were totally gone before I got a full photo of the table. The were too sweet to resist! As always beautiful! I love the bling pops! Once again, you have done a FAB job!!! Can I please share these pics with my blogger friends.. I am definitely going to be using some of your ideas for an upcoming event!!! Where can I get clear ring pops.Please help..pllleeease !